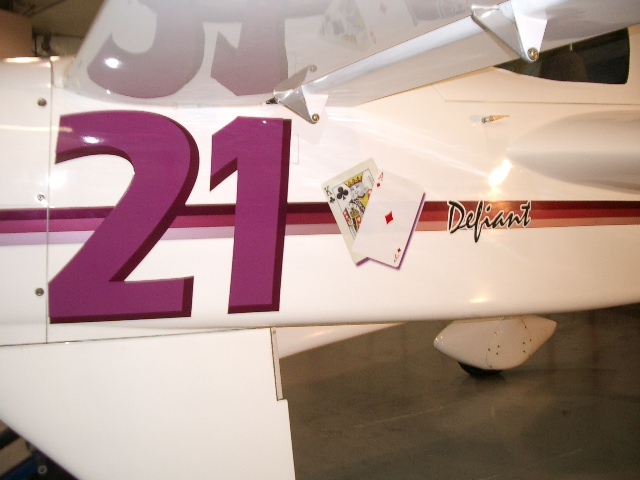 Harry Manvel's defiant looks all the part of a serious traveling aircraft and at the same time oozes "coolness". 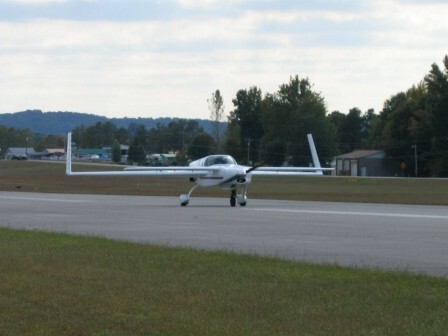 N2HM's first flight was November 11, 2000 after 4800 hours and 15.5 years of work. The time that was put in really shows, from the impeccable panel to the fine paint and graphics. It is a true two engine work of EZ art. What EZ driver would not want to settle down for a long cross country looking at this? A very well planned out panel with everything needed and then some for serious travel. The panels are removable for access to the rear of each section. Another change that was made from the plans is the pilots seat was made removable for fuel valve access. You can see from the side view how much larger the Defiant is compared to the Long-EZ. Harry added defrosters to keep the canopy clear and also modified the shape of the rear windows. It looks like it's moving at 200kt's just sitting there. Armpit scoops ala Berkut keep the lines over the engine clean. The exhaust is a 4 into 4 design that exists out the rear cowling. 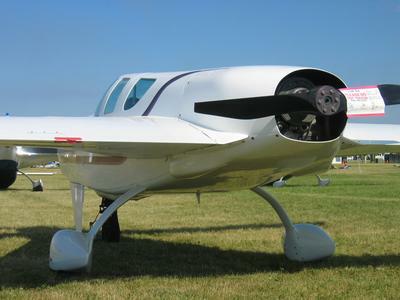 The ailerons were moved further outboard for improved roll response. 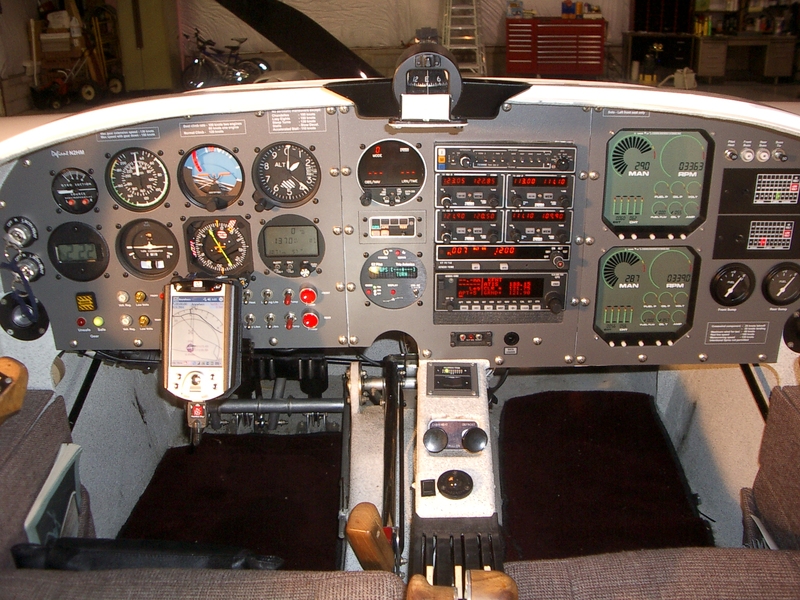 The engines are are Lycoming O-320 B1A, 160 hp Piper Apache engines with two LSI Plama II Electronic Ignitions. 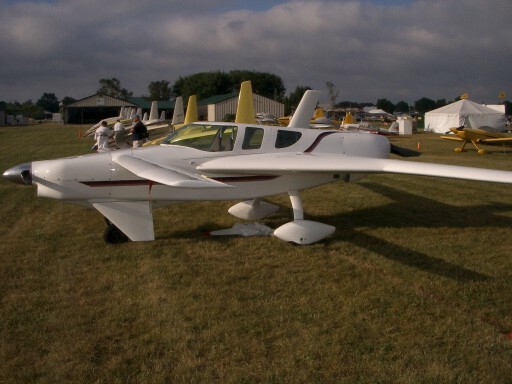 That front prop will make most Canard drivers do a double take.